Dozens Of Writers Join Protest Of Free Speech Award For 'Charlie Hebdo' : The Two-Way Nearly 150 writers have now signed an open letter that condemns the attacks on the French satirical magazine, but questions whether it deserves a free speech prize for its willingness to offend. 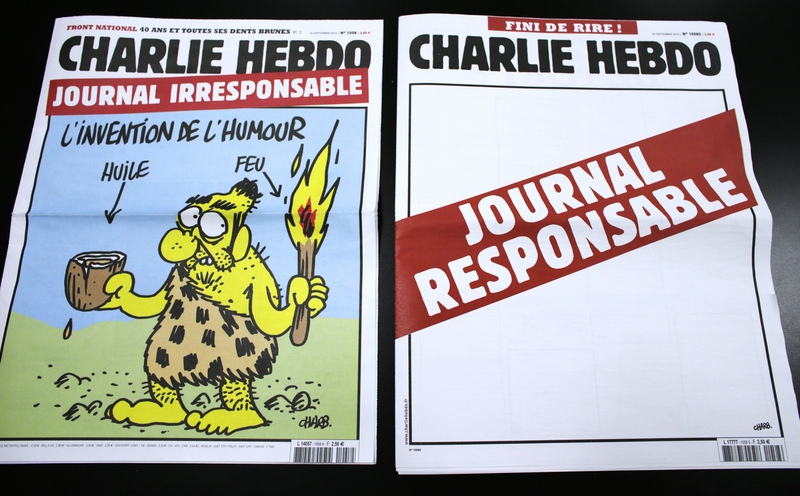 This pair of Charlie Hebdo covers from 2012 pokes fun at the magazine's "irresponsible" approach to humor. Former PEN American President Francine Prose was one of the original six. She tells NPR that as of Thursday afternoon, she's been joined by nearly 150 other writers — such as Junot Díaz, Lorrie Moore and Rick Moody — who've signed on to an open letter critical of the decision. "It is clear and inarguable that the murder of a dozen people in the Charlie Hebdo offices is sickening and tragic," the letter reads. "What is neither clear nor inarguable is the decision to confer an award for courageous freedom of expression on Charlie Hebdo, or what criteria, exactly, were used to make that decision." "Power and prestige are elements that must be recognized in considering almost any form of discourse, including satire. The inequities between the person holding the pen and the subject fixed on paper by that pen cannot, and must not, be ignored. "To the section of the French population that is already marginalized, embattled, and victimized, a population that is shaped by the legacy of France's various colonial enterprises, and that contains a large percentage of devout Muslims, Charlie Hebdo's cartoons of the Prophet must be seen as being intended to cause further humiliation and suffering." Current PEN American President Andrew Solomon told NPR on Monday that Charlie Hebdo deserves the award. "There have been very few places where people have consistently and constantly been willing to say the things that are offensive and to defend them as part of free speech," he said. The anti-Charlie Hebdo PEN protesters blame the victims, make satire defer to religion; gag freedom and contextualise away murder. Salman Rushdie, famously the subject of a fatwa after publishing The Satanic Verses, also came to PEN's defense in a letter to the organization. "This issue has nothing to do with an oppressed and disadvantaged minority," he wrote. "It has everything to do with the battle against fanatical Islam, which is highly organised, well funded, and which seeks to terrify us all, Muslims as well as non Muslims, into a cowed silence." The gala is set to be held May 5. Charlie Hebdo editor Gérard Biard is expected to accept the award, along with the magazine's film critic Jean-Baptiste Thoret.